Named one of the “Top 10 Happiest Places” in Missouri, Lee’s Summit is a pedestrian friendly city in the Kansas City metro area. This remarkable suburb is home to around 91,800 residents southeast of Kansas City, in both Cass and Jackson counties. 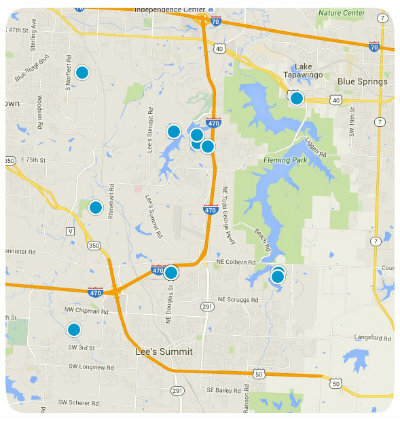 Composed of 65.87 square miles, Lee’s Summit is a clean, safe place to buy a home and raise a family. Students in Lee’s Summit are served by numerous excellent school districts, and parents are also pleased to find a plethora of cultural and historical points of interest nearby. With convenient access to I-470, M-150, M-291 and U.S. 50, residents of Lee’s Summit can easily travel to K.C. and enjoy all of its outstanding dining, shopping, entertainment and recreation opportunities. With all of these wonderful features, it is no wonder Lee’s Summit is such a popular destination among homebuyers looking to relocate in the K.C. metro area. Real estate in the Lee’s Summit area varies in price depending upon a variety of factors including the property’s age, size, location, style and special features. In Lee’s Summit you can find condos and townhomes, single family homes, luxury homes, lakefront properties and everything in between. These great properties can be found in gated, golf and master-planned communities. One of Lee’s Summit’s most noteworthy family-oriented communities is that of Raintree Lake. Raintree Lake is a privately owned community off M-291 in southern Lee’s Summit. Home to a 240 acre lake, this remarkable community is home to around 1,900 property owners and is served by two top-notch school districts, Lee’s Summit and Raymore. Homes on the eastern side of Raintree lake were built in the 1970’s, while those on the western side were built in the 1990’s. Homes for sale in Raintree vary in price but typically range from around $200,000 to $950,000. For those desiring to build in the Raintree Lake community, home sites generally range from around $36,000 to $78,000 depending upon the size and location. If you would like to buy a home or home site in Raintree Lake, or if you have questions regarding other real estate options in Lee’s Summit, Missouri, please do not hesitate to contact us today for more information. Listing courtesy of Sandy Lobdell of ReeceNichols Cedar Tree Square. Listing courtesy of Seth Bailey of United Real Estate Johnson Cou. Listing courtesy of Joyce La Forte of ReeceNichols Lees Summit. Listing courtesy of Dennis Lyon of Cynda Sells Realty Group L L C.
Listing courtesy of Chuck Quesenberry of Great Lakes Real Estate LLC. Listing courtesy of Missy Barron of ReeceNichols Lees Summit. Listing courtesy of Sharlette John of ReeceNichols Lees Summit.